Walter Nash lives on the island of Tenerife. At the age of 78 (rising 79, and piously hoping for 80), he writes variously -- essays, stories, above all poems. His themes are exile identity, fellowship, the varieties of perception, human oddity, the spirit of place, the Creator Spiritus, the beauty of the natural world, the joy of words enshrining the Word. He relishes humour, parody, satire. He has enjoyed a maverick´s version of an academic career, as a medievalist first, then as a teacher of general English Literature, drifting into Linguistics, teaching Phonetics, and finally becoming a specialist on usage, on rhetoric, on jargon, on literary language. 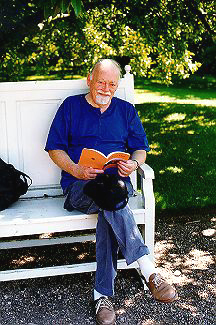 He retired in 1991, as Professor Emeritus of Modern English at the University of Nottingham. He has published in the usual way - as the writer of scholarly papers, reviews of current fiction, contributions to symposia, and as author, or co-author, or editor, of a dozen books, the most recent of which are Language and Creative Illusion (Addison Wesley Longman, 1998) and A Departed Music: Readings in Anglo-Saxon Verse (Anglo-Saxon Books, Thetford, forthcoming October 2004). His verse has appeared occasionally in periodicals, but mainly in chapbooks published by a small press, Feather Books. For Feather Books he is presently engaged in the editing of A House of Pilgrimage, a collection of some varieties of religious and not-so-religious verse. Of his own Anglo-Catholic religion, he says I only go (to church) for the bread and the wine. On writing, he quotes Samuel Beckett´s dictum: fail better. He was born and brought up in a shipbuilding town in the north-west of England. His father (a marine engine fitter) and his mother have been and are still his greatest influences. He has written about them in a short memoir called The Day of the Airship (Cromwell Books, 2002). They taught him about faith, hope, charity, self-respect, and the necessity of being a lefty, a position he has never abandoned.